At Greeley Furnace Heating and Air we offer of range of water heaters, both standard and tankless to serve your family’s needs. Everyone is familiar with traditional water heaters and how they operate, water sits in the tank until someone turns on the hot tap. As this heated water is used, the tank is refilled and heated over and over again. 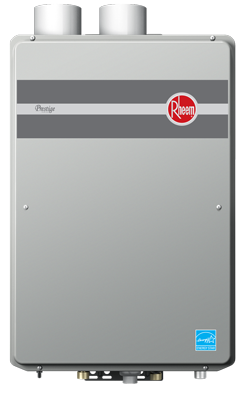 Greeley Furnace Heating and Air would like to offer you the latest technology, that is more efficient and responsive, the Rheem Tankless water heater. Some models qualify for utility rebates. The trend in water heaters today is the tankless water heater only using energy to heat the water when you need it. For large families the tankless could be very convenient because the supply is endless and not limited to a 40-50 gallon tank.